Still we have had no rain to speak of but we have had some very strong westerly winds which has made casting for most messy and uncomfortable. Winter must only just be around the corner as the wind today had some real bite to it and reminded me of those cold mornings down river in the dark waiting for the sun to come onto the water. 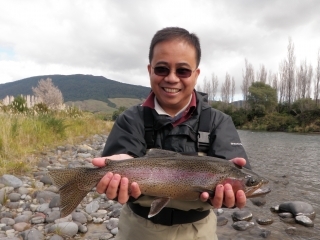 As I drove to the Tongariro with my two clients Lawrence and Francis I noticed a few locals in the Waitahanui fishing the straight in hope that their may beÂ a few fish rolling in and by judging by the number of anglers lined up on the way home something must have been going on. Westerly wind is great for this river and usually brings in good numbers of trout especially leading into the colder months when we should be seeing some impressive spawning runs. I still don’t think the right ingredients are quite there for our first runs but add a good rain andÂ we will have the perfect recipe for exciting fishing. The Tongariro has almost no fishing pressure on it at the moment and now isÂ a great time to fish here just before the bus loads of anglers arrive fighting over the first silver bullets. Little do they know that the best Rainbows are coming through now and if it is a good sized Jack that you are wanting you should be angling here now. I guided half a day today and did not see another angler on the river where we fished-may have been due to the wind I suppose!! 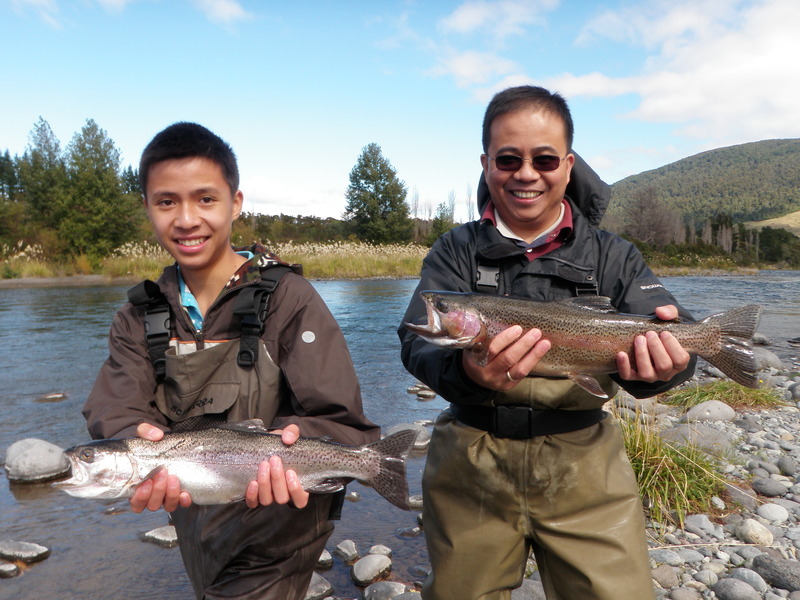 Despite the wind Francis and his son Lawrence from Auckland were a pleasure to guide and we even managed to get aÂ couple of Â fish for the smoker from the Stag pool. Both anglers had not fished before and I felt sorry for them as they persevered with the wind and put some great efforts into improving their casting into a stiff wind which most anglers would have jumped back in the car. Lawrence was the first to hook into a decent fish in the tail of the pool and it was not long and we had the first one on the bank posing for the camera with shaking hands and huge smiles. Francis quickly caught up with the next fish on in the head of the pool which was again a feisty 3lb fish which spent most of the time in the air tail walking about the pool. Both fish were caught nymphing with long leaders and small Quasimodo nymphs which are working very well at the moment with low clear conditions. I have been over the Mohaka twice this week and on both occasions it has been murky bordering on dirty so if you are heading over that way be sure to check the rain for Hawke’s Bay. Luckily I was not interested in fishing but was over that way tracking down a large Stag which I have been trying to get for some time now and as itÂ is the roaring season itÂ is now or never. I have been over twice looking for him this week but as usual it looks like he might even see another year out and keep his ladies happy over breeding time as he manages to avoid me every time I take my rifle-he likes fishing rods though!!! Care should be taken if you are fishing in the backcountry at the moment as there are a heap of hunters sneaking through the forests in hope to find a roaring stag and we don’t want any accidents involvingÂ fisherman. Weekend should again be quiet on the Taupo rivers until the next good rain so getÂ over and check out the Waitahanui or the Tongariro and get amongst some of the best of them. My choice would probably be the Waitahanui straight first thing and then push onto the Tongariro and target places like Big Bend or Blue pool.